"Parts in your printer are at the end of their service life." ... and being the resourceful folks you are, you've scoured the web to find resources like this one. The bottom line is that your printer has reached a point where your printer will not work without some help and you want to print something so, the waste ink kits and resources available from OctoInkjet are here to help. 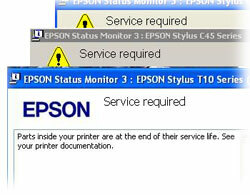 Can you reset your printers waste ink counter (and stop that annoying "service required" message). If all those are positive you can then purchase a kit and gain access to any free reset utilities and support. *Note: Many printers share the same design features relating to waste ink pumps, tube pathways, etc... As as result you will often find a guide intended for a printer different from your own, relates to your printer too. The Quickfind tool provides the information on the kit type compatible with your printer model but there are some options available so this article helps provide a bit more information to help with your decision. Obviously you can still contact me to ask for help if you're still not sure or if you have some custom requirements.